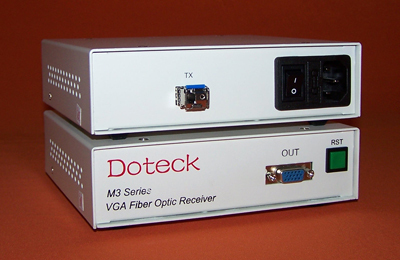 M3 series is mini VGA/RGBHV computer image fiber optic transmission system featured by high performance and low cost. It can transmit one channel of one-way VGA/RGBHV video, one channel stereo audio and 2 channels of RS-232 data through 1 multimode fiber. With multimode fiber, the transmission distance is 400-800m, or even more far. Up to WUXGA (1920x1200@60Hz) resolution.